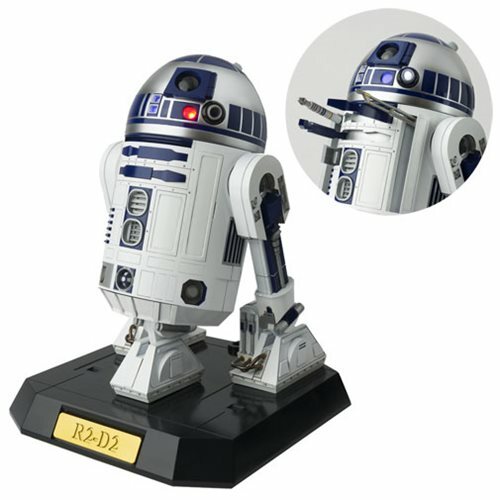 Highly detailed diecast metal model kit of R2-D2! Based on the movie Star Wars: Episode IV - A New Hope. The hatches open to reveal manipulator arms! Transforms between bipedal and tripedal modes. Features 8 LEDs that illuminate to capture R2-D2's expressions! Based on the movie Star Wars: Episode IV - A New Hope, the Star Wars: A New Hope R2-D2 Chogokin x 12 Perfect Model Kit is a highly detailed diecast metal model kit of the famed astromech droid. Standing about 6 9/10-inches tall when assembled, this R2-D2 can do almost everything. The hatches open to reveal manipulator arms, it can transform between bipedal and tripedal modes, and it even has 8 LEDs that illuminate to capture R2-D2's trademark expressions! The plastic and diecast model includes a cover for use when in bipedal mode, a stand, and a droid control bolt. This is the droid you're looking for! Requires 2x "AAA" batteries, not included. Ages 15 and up.